After failing to score against Barcelona and following Celtic's narrow win against Spartak Moscow, Benfica are out of the Champions League. The Eagles' were penalised by their profligacy and will have to keep fighting for an European trophy in the Europa League. On the wrong side of the odds and faced with an uphill battle, Benfica had to at least get the same result as Celtic against Spartak Moscow. Their task was made a bit easier by Tito Vilanova, who rested several key players (including Messi, Xavi, Iniesta, Busquets, Dani Alves and Piqué) and instead gave his second string valuable minutes in the Champions League without the inherent pressure of a result. 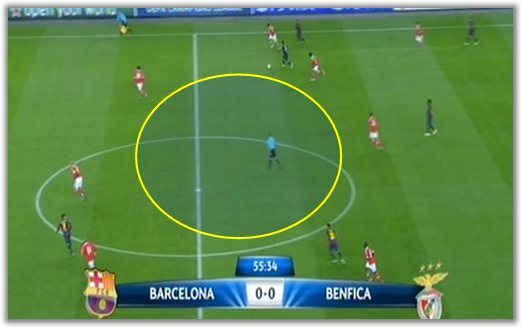 The feeling that that would play right into Benfica's hands was confirmed as soon as the match started. Unlike what they did in their own turf (oddly enough), the Portuguese team came with a intense pressing approach out of the gate, pinning Barcelona back. With Pinto in goal instead of Vítor Valdés and with a makeshift back four, Barcelona found it hard to play out from the back, particularly under the pressure of Rodrigo, Lima, Ola John and Nolito. Even the young tyro André Almeida was pushing high up, tracking Alex Song when he (or another midfielder) dropped back to try and provide an out-ball. 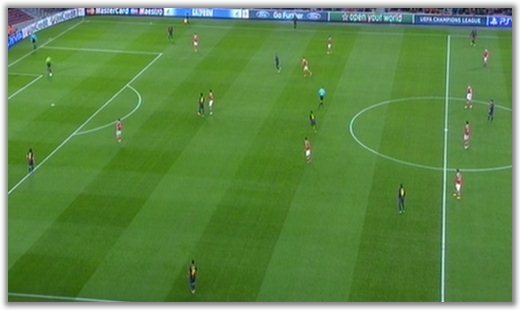 Benfica pressured Barcelona intensely for the entire first half. Benfica were solid and defensively aggressive, managing to win numerous balls back, due to their intensity. The Catalans B team are clearly not as good or used to playing together and often misplaced passes. 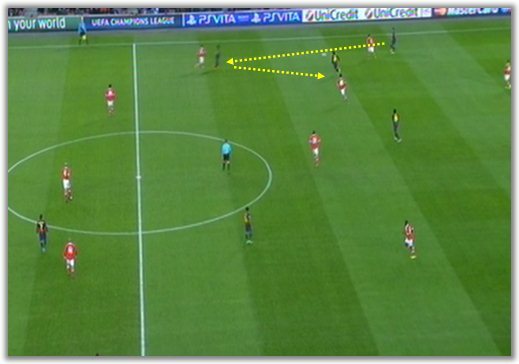 On top of that, Benfica were quite cleverly exploiting the space behind the centre-backs, who, according to the team's principles, remained deployed in a high defensive line - but often with little pressure from their midfield. Benfica's first clear-cut scoring chance came on the 11th minute, with Rodrigo getting behind the defence and then selfishly choosing to shoot instead of playing the ball to Nolito, who was furious at his team-mate. The same Nolito provided a lovely cross for Lima to head wide ten minutes later. Barcelona started showing their teeth shortly afterwards when they successfully found their way out of Jorge Jesus' defensive maze: Matic would stick to the highest midfielder, André Gomes would track the one dropping back, but the third one (usually Sergi Roberto) was always free to collect the ball and break past Benfica's midfield, as proven by their opportunities on 23 and 24 minutes. particularly during the second half. Barcelona found acres of space behind Matic and André Gomes. Benfica, however, kept their foot on the throttle and remained adamant at pushing forward - and almost got the reward for it, with Lima hitting the post on 31 minutes, after Adriano's well-timed tackle fortuitously found the Brazilian forward's foot. A few minutes later, Lima would become the provider of a beautifully placed long ball towards Ola John, who turned his opponent inside out, but allowed Pinto another good save. Whenever Jesus' men got the ball out wide, their opponents' knees buckled. The second half was a whole different game. 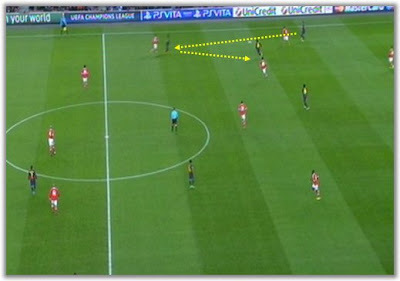 Benfica started to tire out and their pressing was not as effective. Therefore, Barcelona found it easier to get into their usual passing rhythm and find chinks in Benfica's armour. With Ola John and Nolito offering less and less protection to their full-backs, Tello ran riot against Máxi Pereira, who seemed to lose his temper once or twice, but managed to keep it together. Also, Lima and Rodrigo remained high up, which meant that the trio of Song, Sergi Robert and Thiago Alcântara had the necessary space and time to pick their passes. Fortunately for Benfica, this group of players' timing for the through-ball was not as accurate as it usually is, allowing Benfica to successfully deploy the offside trap. Messi came in after 58 minutes (with Villa going right) and immediately drew several fouls just outside the box - and he was also more dangerous at providing key passes for Villa or Tello. Messi himself would get into an excellent position to score, but Artur's brave save avoided the worst for Benfica, with the Argentinean being stretchered off after that duel. By then, Benfica had already changed into a 4x3x3 shape, with Matic behind André Almeida and André Gomes, and Bruno César and Ola John on the wings supporting Cardozo. Benfica wasted a very good chance not only to win at Nou Camp, but to progress into the next stage. They benefitted from a perfect storm, with Barcelona fielding a team comprised of youngsters and second-string players. The Eagles have only themselves to blame for not scoring on (at least) one of the several opportunities they had to lock the score. The Europa League awaits - and with it another shot at an European trophy.